Here is a fun math activity I use with my students, after I teach them to play the game of set. To other teachers — feel free to clone this idea. First, I ask the students if they know what a magic square is. They usually do know that a magic square is a three-by-three square of distinct digits, so that every row, column and diagonal has the same sum. Then I ask them what a magic set square might be. Often they guess correctly that it is a three-by-three square made of set cards, so that every row, column and diagonal form a set. Once that’s established, I have them build magic set squares. While they’re building them, I ask a lot of questions, from how many cards there should be in the deck to how many different sets there are. Once the squares are built, I ask them what a magic set cube might be. Their next task is to use their magic set squares as the bottom layer in building magic set cubes. In order to see all the cards in the cube, I instruct them to arrange the layers (bottom, middle and top) side-by-side. As they’re working on their cubes, I continue quizzing them. How many main diagonals does a cube have? Once they confirm that the answer is four, I ask them to show me those diagonals in their magic set cubes and check that they are sets. I might also ask them how many different magic set squares should be inside a magic cube. This is a theoretical math question they need to answer before finding them in their own model. Next they need to identify the different sets that form lines inside their cubes. At this point, some students guess my next request: to construct a magic set hypercube. After students build their hypercubes, they never want to destroy them. They like comparing the different hypercubes and often take photos of them. If there’s still time left, I can continue in several directions. For example, they can count the main diagonals of the hypercube and find them in their models. Alternatively, they can find a “no set” — the largest possible set of cards inside a magic set hypercube that doesn’t contain a set. Math is usually about thinking, but this is one activity the students can do with their hands. And that adds another layer of magic. If you arrange the cards in “the usual order”, by which I mean you group them by color, shape, number, and shading, then you will have a set magic hypercube. In this hypercube, all of the broken diagonals are sets, also. Is this true in all set magic hypercubes? If so, then is every set magic hypercube an affine transformation of this, most basic one? I love the game of set and I think it is very productive to teach it to students. In America, especially, this game is of value. The game has a lot to do with deductive reasoning and pattern recognition — a key principle in multiple choice examinations. To succeed in the American form of education one must excel at this skill. What is the largest possible set of cards with no SET? 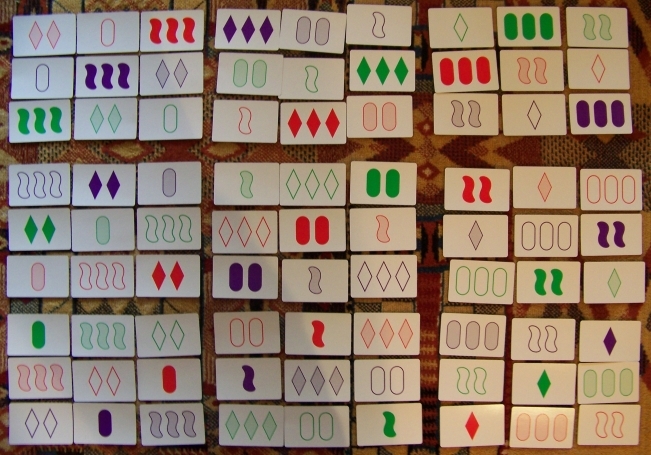 I believe I can construct 20 and I have a tedious case-based proof that every set of 22 cards contains a SET, so (I think) the answer is 20 or 21. Is there a simple proof, (whatever the answer is)? The largest possible “no set” is 20. I’ve seen this statement in many places, I haven’t seen a proof. So I assume there is no “easy” proof.